The first dragon fruit plantation in the Ilocos Region is now a sight to behold and it has turned the plantation into an agri-tourism site offering home-stay facilities and walk-in tours of the 10-hectare farm. 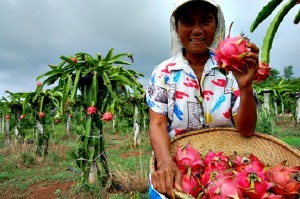 The farm, named Rare Eagles Forest Marine and Agricultural Development or REFMAD, also offers research and livelihood training to locals who wish to start their own dragon fruit farm. Owned by this town’s outstanding farmer Edita Dacuycuy, the sprawling property includes a resort and accommodation facilities with dragon fruit as its main attraction. The family decided to build home-stay facilities for visitors who wish to watch how the dragon trees bloom at night. “The flowers almost glow in the dark and they produce an aromatic scent that spreads throughout the farm,” Dacuycuy's daughter Mildred, who helps in running the family business, said. Dacuycuy organized a group of dragon fruit growers in the province known as the Kailukuan Saniata Cooperative as part of her community work providing tree saplings for their farms including lectures and demonstrations on fruit growing. “I even give saplings for free to neighbors who wish to grow fruits for their household consumption,” she said. A separate plot of Dacuycuy’s farm has been reserved for the dragon tree plantation of the Ilocos Agriculture and Resources Research and Development Consortium for its research work. “I share everything to my community from employment to livelihood. For as long as you have delivered the mission, the commission will follow… this is my advocacy,” she said. For her community work and growing business venture, Dacuycuy was first recognized as Magsasaka Siyentista in the Philippine Council for Agriculture, Aquatic and Natural Resources Research and Development’s Science and Technology-based farm project in 2008. She was also a National Gawad Saka awardee in 2010 and outstanding farmer-innovator by government and non-government institutions.